Quite simply: Quality paper that's beautifully printed! A superb quality letterhead each order printed individually to ISO 12647-2 international colour standards at prices you'd expect to pay printing companies more accustomed to ganging jobs together. 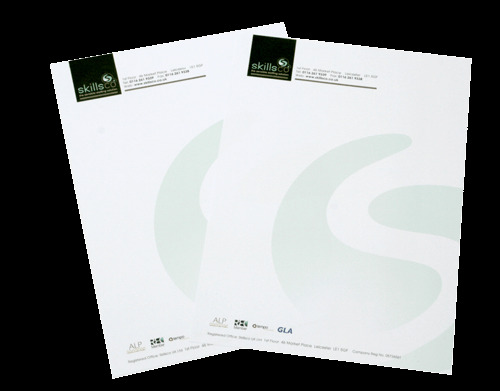 All of our Letterheads are printed onto an environmentally friendly 'A' grade branded paper that is fully approved by the FSC (so you can be sure of a consistent look and feel but more importantly problem free overprinting every time you order. Our 'Standard' Letterhead paper is suitable for the vast majority of applications (it's actually the same brand of paper we use ourselves) but if you need a heavy solid ink coverage printing on the reverse, 'Splendorgel' is the best option as the manufacturing process gives it a very smooth reverse which is less prone to mottling than the majority of papers. Every job at Flexpress is printed using the finest technology available. You wont receive any products printed on beefed-up photocopiers from us - another reason we back everything with our total satisfaction guarantee. Our letterheads are Printed lithographically using LED UV inks so whatever type of printer your client uses, you can be sure they won't smudge, smear or jam. Our letterheads are trimmed using highly accurate programmatic guillotines. This ensures that even letterheads with tight borders are cut accurately. They're packed in extra-strong, double-walled, unbranded cartons that will stand up to the rigours of national carriage.